The Land and Reforms Department of West Bengal has now made it easy for citizens to get information related to their land or property. All these details are available in Banglarbhumi Website, an online portal that has proved beneficial ever since its inception a couple of years ago. Thanks to this portal, you do not have to visit West Bengal Land’s offices in order to get a given service. Few more services are introduced by banglarbhumi officials those are 30 days notice mutation case, mouza map request etc. Banglarbhumi website gives residents of West Bengal the chance of checking their mutation plot Khatian status. Unfortunately, not every person can perform this action without encountering difficulties. This is because the site has quite a number of services which may not be easily identified by a new user. If you want to check the mutation case status, then the simple step by step guide given below will come in quite handy. Open you installed web browser and go to the official page of Banglarbhumi website by using https://banglarbhumi.gov.in as the link. Once in the website, click on “Sign in” button to log into your account. A new page will appear on the screen of your Smartphone, Desktop or Personal Computer. Here, enter your login credentials i.e. Username and Password correctly. Next, enter the captcha as it appears in the image. Alternatively, you can click on “Refresh” button to get a new captcha. Click on “Submit” button to log into your account. Click on “Citizen Services” tab that can be clearly seen on the homepage of Banglarbhumi website. This action will generate a drop down box from where you should click on “Mutation Plot Khatian Status” option. 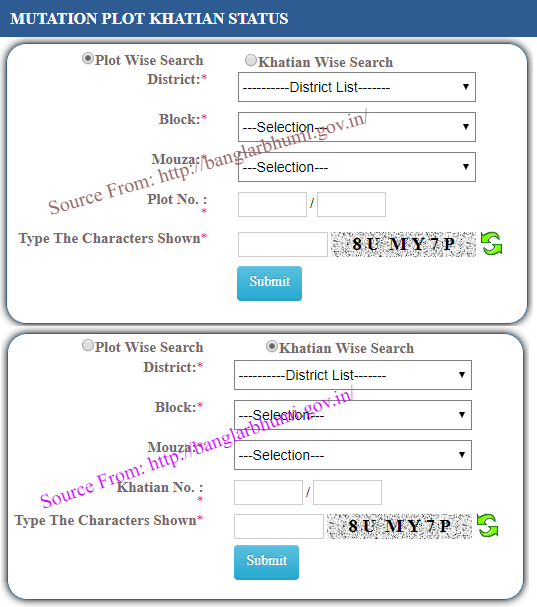 In this service you can search either Plot wise Search or Khatian No wise Search. You will be redirected to a new page on the site. Here, you must select your district from the options given. Select the Block name by scrolling down the options displayed. Select the name of your Mouza. Next, fill in the plot number correctly in the space set aside for this detail. Enter the captcha as it appears in the captcha image. Finally, click on “Submit” button to submit the details that you have just filled. You will now be able to check the status of your Khatian. Once you have everything that you need, click on “Sign out” to log out of Banglarbhumi website. You will therefore keep your account safe and secure. Banglarbhumi website has really helped the people of West Bengal. This is because they no longer have to worry about long queues and closed offices since the site is operational 24 hours a day. In addition to this, they can now access the services from any location of their choice. Unfortunately, you should have an internet connection and a device that can access the internet. You must also make sure that you have a strong internet connection if you are to access each services within the shortest time possible. Remember to use a web browser that will not make it hard for you to navigate through the site.